Helpful hints: since iron ore information should be accurate for its dressing flow, our engineers need to know well about your raw materials before designing the dressing solution. Iron ore is typically classified as High grade (+65% Fe), Medium grade (+62 – 65% Fe) and Low grade (-62% Fe) by the content of Fe. Very low grade iron ore can not be used in metallurgical plants. You will need the iron ore beneficiation plant to upgrade iron ore by increasing the iron content and reducing the gangue content. Very low grade iron ore in large lumps is firstly sized through crushing process. The common crushing machines used in iron ore beneficiation plant are jaw crusher as primary crusher, cone crusher or fine jaw crusher as secondary crusher. 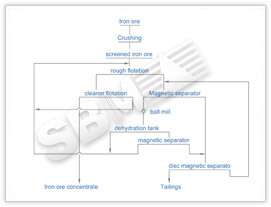 The iron ore materials of required size after screening then pass to the flotation process. The crushed iron ore passes to low intensity magnetic separator, and materials of high magnetic pass to cleaner flotation and thickener flotation. The pure product of flotation cleaner is iron ore concentrate, while the iron materials with low Fe content are moved back to rough flotation for further separation. The product after thickener flotation is grinded by ball mill into fine particles and moved to dehydration tank and then successively to high intensity magnetic separator and disc magnetic separator for further separation. Low content iron ore is moved back to thickener and very content iron ore is discharged as tailings.